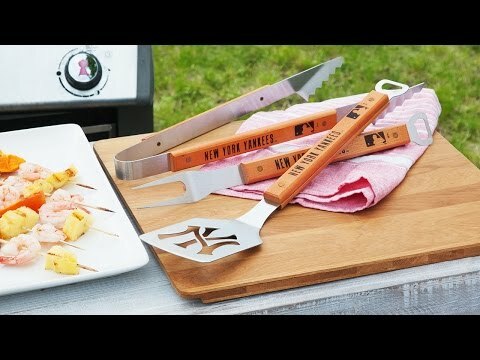 For any superfan who likes to grill, this sports team grill set shows off team pride. 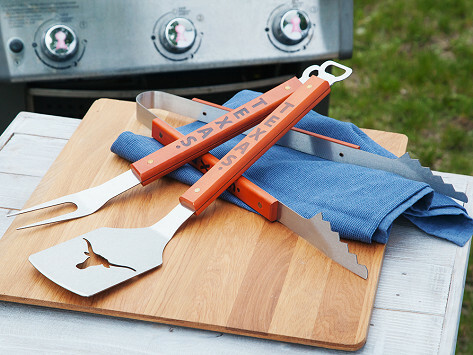 The three-piece set includes a heavy-duty spatula, grill fork (both with built-in bottle openers), and tongs. Made from stainless steel and hard maple wood, each bears a bold, laser-etched logo. Pick your favorite from every major-league sports team, over 140 college teams, or any branch of the military. Dimensions: 22" x 9" x 2"
Love our Sportula Set! Well made and very sturdy! Gift for brother in law. He loved it. This is a Christmas gift for my Badger fan son-in-law. Hopefully, he'll love them.